The second line ends with "rose," the third line with "exploded." These nearly rhyme. The sixth, seventh, eighth, and tenth lines carry an "oo" sound: shoot / through / soon / you moved. The eleventh line is a near rhyme with these, ending in "mouth." The seventh and eighth lines rhyme, ending with "through me" and "to be" respectively. The fourteenth and fifteenth lines nearly rhyme, ending in "day" and "saying" respectively. Finally, the nineteenth and twenty-first lines rhyme, ending with "deer" and "fear" respectively. The poet reveals in her notes that this is a poem about the certainty of uncertainty in love. The title refers to the desire of lovers to diminish the uncertainties concerning the feelings that they have for each other. 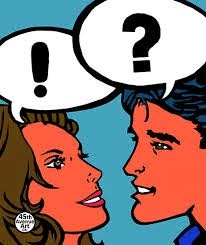 In order to understand each other truly, each lover wants the other to speak in a language of pure truth--one that does not sometimes beg the question, "What did he/she mean by that?" The unusual rhyme scheme in this otherwise free verse poem reflects this universal sentiment. The near rhymes reflect the feelings of insecurity, particularly those felt in the beginnings of a romantic affair. The true rhymes reflect certainty--or perhaps only the certainty of uncertainty.